I grew much closer to God following what doctors acknowledged as an unexplained healing. I hemorrhaged when I was 12 and lost a third of my blood supply. My mother prayed for Our Lady’s intercession to heal me. That experience strengthened my faith and my family’s faith – I realized God had a plan for me. I knew if I followed God’s will I would experience true happiness and I felt God calling me to attend Boston University. I had a strong desire in my heart to help people and following my 2007 graduation I began my Master of Public Health degree while working at the American Cancer Society. It was also during undergrad at BU that I met Mother Olga and she became my spiritual director. I went on retreat in February 2008 and in adoration we ‘Touched the Garment,’ which is taken from Luke 8:43-48 where the hemorrhaging women touches Jesus’ cloak and is healed. This particular passage always meant a lot to me because of my own healing experience. As the priest and Jesus in the Eucharist stood before me, I touched the garment that was touching the monstrance. I felt this overwhelming sense of unconditional love like I had never experienced before. I also felt like I was truly touching Jesus’ cloak – the realization that I was in the true presence of Christ. I cried and was so moved by that moment of divine grace. While I continued to pray I heard a voice from within me, but was not my own, say “I want you.” I knew the “I want you” meant He wanted me to follow a religious vocation so that I would completely belong to Him and no one else. I was upset and began to argue with Him – I had other plans of doing holy things to serve the Church. I was going to get married, have children, and be a strong Catholic voice in healthcare. Part of me wanted to forget about the experience, but it was so strong that I couldn’t let it go. I met with Mother Olga and she was also surprised by my experience because we never talked about religious life before. She also shared with me that Cardinal Sean O’Malley had recently asked her to consider forming a new religious community. I know there is no such thing as a coincidence and that God’s hands are in everything, and this was very providential. Mother Olga gave me a discernment workbook to help me pray and recognize God’s will for my life. The book suggested some lifestyle changes such as the rosary, fasting, daily mass, and cutting out media and increasing silent time in order to better hear God’s voice. God continued to call me closer to Him during the following three and a half years of my discernment, but there were many moments when I tried to push Him away and reasoned that I needed to “experience more of life.” I took up salsa dancing and dated. In February 2010 I realized I really needed to walk with the Lord during Lent – I had maintained, and still do, the lifestyle changes recommended in the discernment workbook. He spoke to me in the silence and it was time to give more attention to my discernment. Our relationship deepened and He continued to draw me into Him. In May 2011 I went on my first discernment retreat with Mother Olga and other young women. I knew I had to take more serious steps and finally told my parents about my discernment. In June I spoke with Mother Olga and learned the community would live like the Holy Family did in Nazareth and focus on bringing Jesus’ loving presence to the world through the corporal and spiritual works of mercy. I felt filled with the Holy Spirit and on fire. This synced with my own spirituality and my desire to be a Catholic presence and serve people. 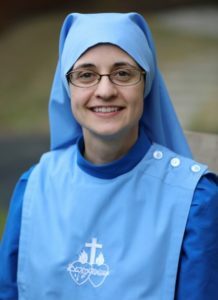 Following a second discernment retreat in October and after much prayer, I discerned it was time to apply to be an Aspirant with the Daughters of Mary of Nazareth community. I have felt drawn further into the Daughters of Mary of Nazareth’s charism and spirituality and that God has confirmed my vocation call. Even when I see other beautiful vocations and religious orders, Peter’s words come to my heart “Lord, to whom would we go? You have the words that give eternal life” and I have truly drawn closer to the life-giving Christ with the Daughters of Mary of Nazareth. I was raised Catholic and have generally always believed in the teachings of Christ and His Church, but Senior year of college was a time of dramatic change in my relationship with Him. I lived in an apartment dubbed “The Lodge” with 3 women from the campus ministry. Inspired by Acts 2:42-47, we prayed together daily, lived simply, shared a family meal once a week, and invited women from the campus ministry to stay with us for the Triduum, fasting and praying together. The two years I lived at the Lodge were among the most joyful, purifying, transforming years of my life. We loved each other as sisters and called each other on to holiness. During that time I found my home in Christ, in His Sacred Heart, and consecrated myself to Him through the heart of Our Lady. Not only did the Lord draw me into a deeper conversion through that experience, but He also planted seeds of my Vocation and specifically of the charism of the Daughters of Mary of Nazareth. After graduation I worked as an Engineer for about 4 years. There were many things I enjoyed about my job, but I felt a growing restlessness and sensed that God had something more in mind for my life. Through prayer and discernment, I discovered that He was calling me to full time ministry and took the big step of quitting my job and becoming a missionary with FOCUS (Fellowship of Catholic University Students). As I sat in the Chapel at my first week of summer training, I was overwhelmed with peace. I could say for the first time that I was doing God’s Will. It was an amazing gift that allowed me to dive deeply into the mission. Part of my commitment to FOCUS included a fast from dating relationships for the first year. In January of my first year on campus, I went on a weeklong retreat at the Theology of the Body Institute. The question of Vocation quickly came up, and in my prayer that week I experienced Jesus, the Bridegroom, inviting me to Himself. As the days went on, I realized the deep desire I had in my heart to respond to His invitation, to be united with Him in Consecrated Life. His call and my desire continued to grow in the months that followed. That summer my Spiritual Director and I determined that it was time to visit communities. At that time, I also found out that I was going to move from serving at the University of Connecticut to serving at Boston University for 2011-2012. I knew that Mother Olga had served at the BU campus ministry for many years but didn’t realize why she was leaving. 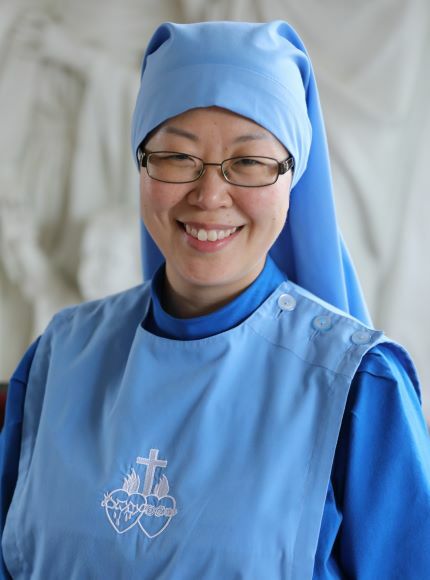 (I had met her for the first time at the TOB retreat that year.) My Spiritual Director told me she was going to start a new Religious Community. By the end of the summer I was felt discouraged after visiting communities and not feeling called to any of them. I decided to contact Mother Olga. We had a very peaceful conversation and agreed to meet up once I moved to Boston. That Fall I went on a discernment retreat with her. Throughout the course of the weekend, I felt a continuous peace and docility of mind and heart. As details were shared about the charism, prayer life, formation, and apostolic work of the new community I felt more and more at home. The Community’s devotion to the Sacred and Immaculate Hearts resonated deeply in my heart and Bl. Charles’ ministry of presence and hospitality reminded me of the Lodge. In my prayer I felt that Jesus was holding out His hand to me and asking if I wanted to come with Him on a journey, the adventure of entering this community. It was a strong contrast to the visits I had experienced with other communities where I had always tried to fit myself into the mold. I came home peaceful, joyful, and excited. Through prayer and spiritual direction I made the decision to apply for Candidacy and it has been an amazing time of grace ever since. “Come and hear, all you who fear God, while I recount what has been done for me” (Psalm 66: 16). As I look over my story with the Lord, and the many blessings He has given me, it seems as though the general tone of each pope’s pontificate corresponds with each season of my own faith journey. It is not that I have been consciously influenced by the popes; perhaps the graces given during each pontificate overflow into the whole Body of Christ. Saint John Paul II was pope when I was born, and his pontificate extended to when my relationship with God became a two-way relationship as a teenager at Catholic Leadership Institute (CLI), offered through the Archdiocese of Boston. At CLI, we were taught by people who loved us and believed in our futures. Whatever problems we came from back at home, we began to experience healing. We tapped into something tremendously invaluable. We encountered Christ. While I would never want to oversimplify Saint John Paul II, it seems that his joyfulness and energy summarize well what was happening in my own life during his pontificate. During summers home from college, the Lord brought me to a young adult group for college students at a local parish. God poured out some of the greatest riches of the Church and gave me solid mentors who showed me what it looks like to live a Catholic life joyfully and authentically, even if it is not always easy. Likewise, it was at this time that Pope Benedict XVI was elected and I began to learn what makes our Catholic faith so unique. Through this college young adult group and the Master of Arts in Ministry Program at St. John’s Seminary, I learned more about the teachings of Catholicism, why we believe what we believe, and why it matters. It was also at this time that I began working for the Archdiocese of Boston, which provided me with the opportunity to attend daily Mass and to go to confession regularly. I began to pray the rosary with much more regularity, and with a deeper contemplation, and made my consecration to Jesus through Mary on the Feast of the Visitation in 2010. The year of my consecration was also the year when I experienced a real sense of belonging in the communities in which I participated, including the Salt & Light Community (now The Second Watch) at the Catholic Center at Boston University, and also yHope (Young Heralds of Pauline Evangelization), part of the Pauline Family. During all of this, the possibility of a call to religious life emerged as a suggestion made to me by a mentor. My response was quite varied; I felt a mix of fear, excitement, panic, and peace. I did not have an answer, but the idea stayed with me. As part of my graduate program, I spent one year as an intern at the Catholic Center at Boston University, serving undergraduate students and experiencing a little of what it is to “sister” others. As that year ended, Mother Olga began speaking about the new community she had been asked to begin. I felt comfortable exploring this Vocation with her, and the ways the community would seek to help heal this hurting archdiocese resonated strongly with me. I attended the discernment retreats Mother offered, but I did not feel peace about entering at the time. A year later I attended a retreat on the Theology of the Body offered through Pure In Heart America. It was at this retreat where I heard a Vocations panel, where people of each Vocation would speak about their lives and their journeys. After the panel I felt a very strong pull to talk to one of the religious sisters. She listened and then responded, suggesting that I could very likely have a call to religious life. And for some reason, from her and at that moment, the suggestion resonated. Not even a month after this significant turning point, Pope Francis was elected to the papacy. As I listened to him, I realized that this humble pope could easily be a powerful instrument in teaching me how to live as a religious, how to live simply, and how to pray. At a time when our culture sees a division between love on the one hand, and the truth as taught by the Catholic Church on the other, the Vocation of a sister can serve as a bridge between the two. The feminine gifts that women often have in abundance can serve as a healing salve for the wounds so many people bear. When I am with the sisters here, I love better. I am excited to continue this journey alongside them, discovering Jesus more in His role as our eternal love. Growing up, I had many career paths in mind. I had, and still have a love for learning, and because of this I studied hard all throughout school. This studying was also accompanied by extra-curricular activities and sports, the predominant one being karate. I started taking karate at age eight and continued through my college years. Throughout these years, my parents and my karate instructors taught me to seek truth and build character from a young age. I maintained discipline in school in hopes of one day going to college and ultimately being successful. I am very grateful that I did attend college and my dream was fulfilled, though the experience was very different than what I had in mind. I was profoundly moved by two main experiences in college. The first was my personal encounter with the Lord which renewed and deepened my own Catholic faith, through meeting the Brotherhood of Hope, Catholic Religious Brothers who oversaw the Campus Ministry at Northeastern. I first encountered the Catholic Center because I had applied for a Work-Study position. But soon enough, it became a home-away-from-home, a place where I not only worked and studied, but also began to pray and attend Mass again, and I met friends committed to living out their Catholic Faith. I was a “Work-study” for the remainder of my time in college, however, I chose to get involved in whatever way I could through retreats, Alternative Spring Break, setting up for Campus Mass, and doing administrative work with other students. Looking back, I know the Lord was working in me during those hours. The Brotherhood of Hope and the community were for me genuine witnesses of fraternal love, hospitality, and peace that the Lord desires to bring to each of us. As I grew in my knowledge of the Catholic Faith and experiencing a full love for the Catholic Center community, I started to look beyond college in a way I hadn’t before and the thought of religious life began as I felt a desire in my heart for this meaning in my life. I decided to make a 90-day discernment with the guidance of a spiritual director to explore this more deeply which helped me to continue to strengthen my relationship with the Lord and discern His call for me, personally. The second major experience in college was one that I had Senior year, again while working. I was working on our Senior Capstone Design Course and Project and was blessed to be in a diverse small group and graduating class. Some students were from many different parts of the world! Coming from a rather small town, going to a university in the city had its own cultural adjustments. I did not think about what a blessing it was to be in class everyday with students from around the world, of many different religious and ethnic backgrounds. It wasn’t until working on this class project that I got to work closely with and for an extended amount of time with international students whom I will always consider lifelong friends. Since this experience of synergy working together and growing in fraternal love, I have longed to see this friendship and peace more present in my daily life and for others to experience it as well. Later when I would be discerning with the Daughters of Mary of Nazareth, I realized through the spirituality of Blessed Charles, that this is a dream for others too, and is possible to live out. After college, I worked for a period of time, through many different experiences, spiritual, family, and relational, I continued to pray and discern my life-long path. I continued to experience a pull on my heart, and a restlessness when I looked to anyone or anything other than God for fulfillment. 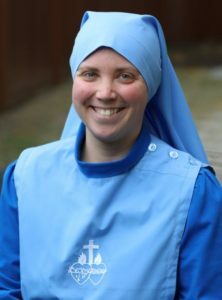 While I continued to search for meaning, direction, I remembered meeting Mother Olga when I went on a pilgrimage to World Youth Day, and whenever I would speak to a trusted friend or spiritual guide about discernment, I was led to Mother Olga. One day after spiritual direction, I attended Mass at Our Lady of Perpetual Help in Boston and ran into her there! So began a period of meeting regularly with Mother Olga and about a year later, discerned to participate in an annual retreat, which led me to take the leap of faith to begin my Aspirancy! I have decided to follow the One who created me, who knows me since my earliest days, and who ever calls me to greater intimacy with Him. I have found my identity in Him and I pray for the grace to continually live in the Identity that is Christ. My first gift from Lord was to be born into a very warm and loving home, where I grew up as the oldest of five siblings in rural Ohio. Unfortunately when I went to college, like so many “cradle Catholics”, the simple faith that I loved in my childhood did not withstand the forces of academic atheism and relativism, and by Christmas break of my freshman year (at a Catholic university no less!) I had entirely lost my belief in God and the Catholic Church. However, as I discovered throughout my years of agnosticism, life with no concept of God quickly loses depth of meaning. In my winding quest for purpose and meaning, I eventually came upon the “philosophical tradition” of the Catholic Church, which to me felt like discovering a mountain range in my backyard that I had never noticed before! God had captured my attention and spoken to me in the way I needed to hear. These intellectual seeds of faith came into bloom of lived faith through my next four years, which I spent living with and working with people with all levels of developmental disabilities. In the lives of people whose value is largely disregarded by the world, I discovered that “the Cross stands revealed as the tree of life”; what is seen to be a life of suffering is often in fact a life imbued with tremendous joy and meaning. Within this milieu of both the ‘mystery of suffering’ and the ‘joy of the Cross’, I began to deepen my prayer life and search for the Lord’s will through Mass, Adoration, spiritual direction, and life shared with the vulnerable. The thought of religious life had occurred to me early on in my reversion; however, at that time I had never met nuns or sisters. I decided to spend a week in a monastery to see what it was all about, and the impact was immediate. (Well, not quite immediate: at the end of the first day, I thought “Well, that was too much praying for me, so I guess I don’t have a vocation!”) Yet by the end of the week I was craving that same call to prayer. I left with my soul deeply stirred: by desire for a way of life totally committed to the Lord, and by fear over everything I would have to “give up.” For the next several years I was on a mission to discover the will of God for my life, and across different states and jobs, I continued to visit religious communities. Over a long road, my sense of fear and hesitation was overcome by the honest recognition that religious life was in fact the deepest desire of my heart. However, I had knocked on so many doors and had not felt a concrete sense of “calling.” After many years of searching, I came to believe that my personal call to holiness should be lived out in the celibate single life, through ministry and availability to others. 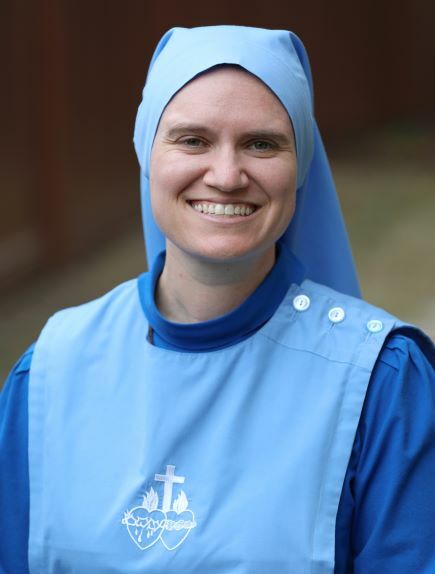 When I heard of the Daughters of Mary of Nazareth, I had finally arrived at a place of deep contentment in my life, living in my hometown among family and working full-time in ministry. Yet in the deepest reaches of my heart, the longing to give myself to Jesus totally in religious life stirred unresolved. Though I believed that I was “no longer discerning,” I made a visit to the Daughters as a “personal retreat.” How to describe the invitation of the Lord? Encountering the spirituality of Nazareth, each element of the life, charism and spirituality felt like the tumblers of the lock falling into place. I realized that a door in my soul had quietly swung open, and the invitation was clear and peaceful. I felt that I was faced with two beautiful paths, of which I could make a free choice: the wonderful life I was already living…and the unknown road of Nazareth. I believed that God would honor my choice. And I know that now that I am here, attempting to walk this road of Nazareth, in the words of Merton’s same prayer, “He will never leave me to walk this path alone”!